LinkedIn, the "Business Social Network" recently launched new applications for Android and Apple devices, which it is following up with a new LinkedIn App for Windows Phones.The LinkedIn App for Windows Phones is rumored to have more functionality and features than the respective apps for Android an Apple.The new application is around 1MB and can be used on phones which are running on Windows 7.5 or above ( Like the Omina M). 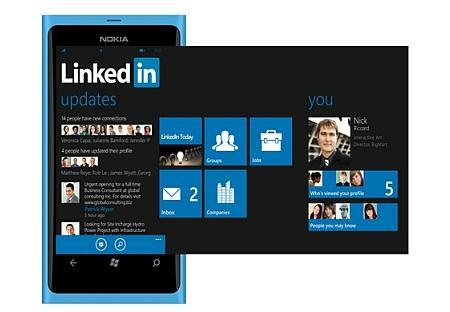 The layout of the LinkedIn App for Windows Phones is inspired by the Windows layout on the phones, the app has live tiles and a Metro Style User Interface.The app is said to better equipped to give live updates of contacts and businesses as well as make an up-to date listing of all the available jobs etc. We know professionals rely on their mobile devices every day to conduct business and to stay prepared for their work day,We've been working hard to make this new LinkedIn app best-in-class in the Windows Phone marketplace.You'll find that in some cases (hint: companies and jobs), the Windows Phone app offers even more functionality than its iOS and Android siblings. LinkedIn is one of the most popular social networks with over 150 Million users worldwide, they are looking to increase this number by releasing a series of apps for the latest generation of smart phone users.